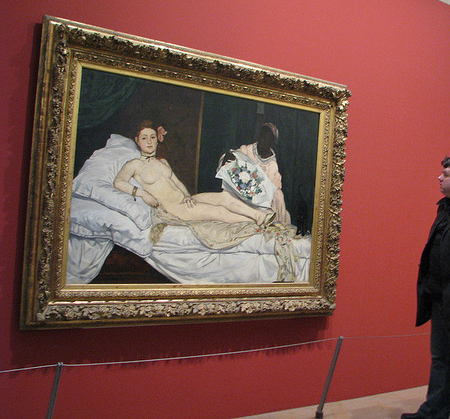 When you are learning to paint, you often “copy” from photographs or famous paintings. Later, you paint from life. Add your imagination and years of painting, and sometimes you notice the original influences coming through. I always drew and painted animals instead of people. The more unusual the animal, the more interesting to me. Patterns and markings also absorbed me for some years. 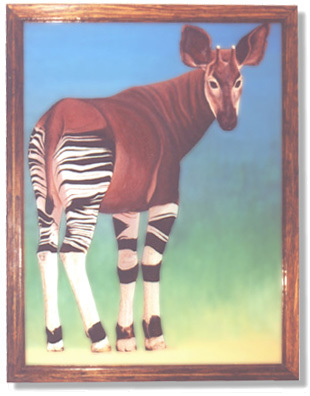 The Okapi is a relative of the giraffe but lives in jungles, such that white people had not known of the animals until relatively modern times. The fetishization of exotic species means they are desirable: alive for zoos and dead for natural history museums. My “Olympia” is on display but directly gazes back at the spectator with dead eyes.